Elishewitz company was founded by Allen Elishewitz, one of the most popular American knives producers. A native of Texas, since his childhood, he has been travelling in many countries of Asia, learning the cultural heritage of different nations. When he was very young, Allen Elishewitz was interested in printing, acid pickling, enamelling, painting and architecture. Allen Elishewitz began to make knives during his studying at college. Since 1998, this hobby has become a professional activity of the young man. In 1994, he joined the American Knifemakers Guild (he is currently serving as a Director on the Board of the Guild). Elishewitz's knives are the standards of the clearness of lines and irreproachable quality. 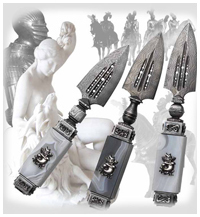 His works have been awarded numerous prizes at the international knife exhibitions. Allen Elishewitz never stops at what has been accomplished, he is in a constant search for new constructive ways of self-expression. In 2002, he began making wrist watches. He has been studying the watchmaking technologies for 4 years. 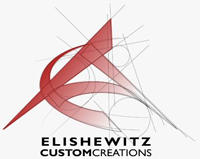 Elishewitz creates the watches primary to order. Annually he develops only several models, that can be surely referred to the true masterpieces of Haute Horology. All Elishewitz's watches are powered by the Swiss high quality movements. The watch glasses are also produced in Switzerland. Traditionally, the thickness of a watch glass is about 1.7 mm. To make a watch more reliable, Elishewitz uses a glass, that is 2 mm thick. While creating his timepieces he uses the techniques of engraving and guilloche, due to this, every model is a true work of art. The entwined dark and light concentric circles creates an intriguing trick of the light and shadow. Allen Elishewitz has developed four watch collections – Triomphe, Triomphe II, Vector, Euclid. Every collection is characterized by its special aesthetics. The watch cases are made of titanium or damascus steel. Damascus steel is the artificial composition material with the patterned surface and rich decorative properties. For many centuries damascus steel has been used in swordmaking. In watchmaking this patterned metal was used for the first time in the 21th century. By using damascus steel, Elishewitz has discovered new points of contact between a cold weapon and a timepiece. Triomphe is the first watch by Elishewitz company, that features the damascus steel case. This watch are optionally powered by the mechanical or quartz movement. The watch thickness also depends on the type of movement. Triomphe II is the advanced version of Triomphe watch. Vector watches are assembled on the basis of pocket watch movements. The distinctive feature of such a model is rather a massive case. Vector watches come with the crocodile leather straps or ostrich leather straps. Euclid watches are the sports models, that feature big polyhedral cases, made of titanium. The Swiss ETA movement is housed in this model.